When it comes to a reliable SUV that won't breakdown, you can count on the 2016 GMC Yukon to be built like solid rock with an incredible foundation! At Vann York GM, you'll find everything you'll need regarding GMC vehicles. Located at 321 Eastchester Drive in High Point, NC Vann York GM serves Greensboro, Winston-Salem, Kernersville, Jamestown, Thomasville, Lexington, Asheboro, and Burlington, NC. The 2016 GMC Yukon has an MSRP of $48,165 while the Ford Expedition has an MSRP of $55,145. If you're interested in saving $7000, here it is! The MPG rating on the Yukon is 16 city /23 hwy while the MPG rating on the Expedition is 16 city / 22 hwy. Interior features of the 2016 GMC Yukon include a power sunroof, integrated cargo liner, power adjustable pedals, cup holders, air conditioning, remote keyless entry, remote vehicle star, tri-zone climate control, Bluetooth wireless technology, 8" diagonal customizable drive display, Bose Centerpoint Surround Sound premium 10-speaker system, navigation system, rear-seat entertainment system, power door locks, rear window defogger, and rear child security door locks. Interior features of the Ford Expedition include manual air conditioning, overhead console with sunglass holder and conversational mirror, power windows, remote keyless entry, tilt steering wheel, Driver vanity mirrors, emergency communication system, rear beverage holders, driver / rear door bins, power windows, illuminated entry, telescoping steering wheel, Passenger vanity mirror, overhead console, AM / FM / CD radio system, six speakers, 1st row LCD monitors, 40/2040 split bench reclining fold-flat seats, and third-row 6-/4- split bench fold seats, 4.2" LCD screen, and wireless Bluetooth connectivity. The 2016 GMC Sierra has a warranty that includes 3 years/ 360,000 miles bumper to bumper warranty, 6 years / 100,000 miles corrosion protection, 5 years / 60,000 miles powertrain warranty, 5 years/ 60,000 miles roadside assistance program, and a 2 years / 24,000 miles two maintenance visit. 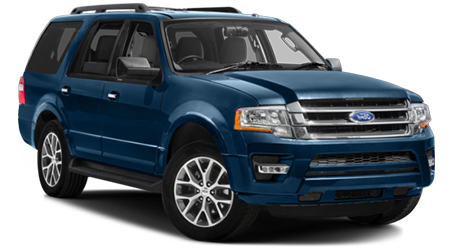 The Ford Expedition warranty includes a Bumper to Bumper warranty for three years / 36,000 miles, five years / 60,000 miles powertrain warranty, five years / 60,000 miles safety restraint system warranty, five years / unlimited miles Corrosion warranty, and five years / 60,000 miles roadside assistance program. The winner is the 2016 GMC Yukon! Come to Vann York GM today where you'll have plenty of amazing vehicles to choose from! When it comes to excellent customer service, Vann York GM is the dealership that is provided!